Perched on the edge of the barnacle encrusted rocks, my heart races with excitement in hope that it might resurface. Only seconds later it does, taking one last powerful breath before diving to feed. I am left with a pungent smell from the mist of its breath. To catch a glimpse of a migrating gray whale is a truly incredible experience. Humbled by the magnificence of the whale, I marvel at the vast and mysterious ocean that surrounds us here in Tofino on the West Coast of Vancouver Island. Often travelling more than 16,000 km, these impressive creatures make one of the longest migrations of any mammal on earth. Not unlike many of us, gray whales are lured down to the warm sparkling waters along the coast of the Baja California in Mexico during the winter months. For newborn whales, born with little blubber, the shallow lagoons of the Baja provide warmth and shelter. However, they don't spend long in their southern mating and calving lagoons. By mid-February newly pregnant females, adult males and juvenile whales begin the long swim north. About six weeks later females and their new calves follow. En route to their summer feeding grounds in the Bering and Chukchi Seas the whales hug the coastline as they swim, often travelling within 3 km of the shore. It is thought that they navigate using bottom contours, familiar land marks, ocean currents as well as possibly the earth's magnetic field to guide them. As many as 50 gray whales spend their summer feeding along the coastline of BC, while the majority continue North. By mid-June the whales have reached their destination, timed perfectly for the peak of the Arctic summer. The high productivity that results from close to 24 hours of daylight makes the Northern waters rich feeding grounds. After months of feeding, decreasing daylight and food supplies signal the coming of the cold weather and the pregnant females again lead the return migration southward. After an 8000 km non-stop swim from the Arctic, the cycle of birth and mating continues once again. The resident gray whales that remain along our coastline during the summer have provided an exciting opportunity for researchers interested in studying linkages between whales and the coastal temperate rainforest. Whales and trees? Surprisingly the two may have more in common than you might have expected. The environment of the West Coast is characterized by the constant interaction between the land and the sea. Because of our proximity to the ocean, Tofino often receives more than 3.5 metres of precipitation annually, in the form of rain, drizzle, fog and mist. Our wind-swept, rain drenched coastline is home to more than one-quarter of the world's remaining coastal temperate rainforests, an ecosystem generally defined and driven by rain, and lots of it. 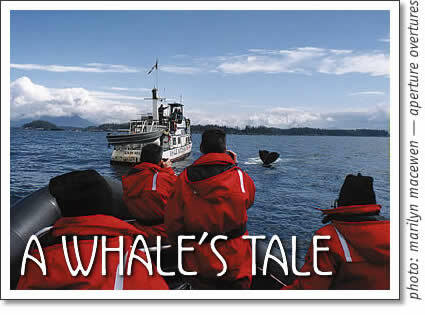 The ocean provides the moisture for the rainforests, but the forests also give back to the ocean and the whales. Rain that falls on the forests eventually makes its way back to the ocean and the water cycle begins again. In a healthy forest ecosystem, small bits of soil and leaves wash into streams and rivers when it rains. These streams and rivers feed into larger rivers, which eventually wind their way into the ocean. Along the way, the small pieces of organic matter breakdown into nutrient rich water. Upon reaching the ocean the nutrient rich waters will become food for small plants called phytoplankton. Tiny worms and crustaceans, which are a preferred food of the gray whale, feed upon the phytoplankton. So, the rainforest is part of the food web of the gray whale! When you take a closer look, things are often much more closely related than you may have thought. Throughout time, cultures from around the world have shared this perception of the Earth, as one of wholeness, one in which everything is one and interconnected.